The Washington establishment does not like the fact that the swamp is slowly being drained. The establishment has acquired wealth and power in the current swamp and does not want to give it up. How many millionaires in Congress entered ‘public service’ as middle class Americans and are now millionaires? How many have taken advantage of knowing about upcoming legislation in order to increase their stock portfolios? How many of them are engaging in activities that they do not want revealed to the public? I realize that there are a few honest men and women in Congress, but I suspect it is only a few. So what happens when they begin to see the draining of the swamp? Can you imaging this lack of civility directed at any other President? This is a prime example of why Democrats (and establishment Republicans) need to be defeated in order for the swamp to be fully drained. We need to remember that Andrew McCabe was fired as a result of an internal investigation at the FBI. President Trump was not responsible for the firing of Andrew McCabe, although I am sure he supported it. McCabe was guilty of lying to the FBI under oath and leaking information. Either one of these offenses is enough to get you fired from the FBI. 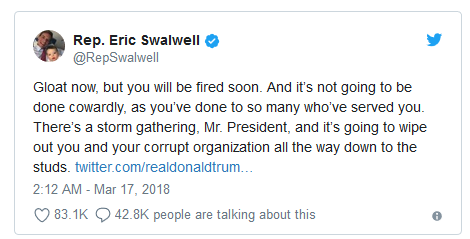 If Representative Swalwell supports equal justice under the law, he should be supporting the firing of Andrew McCabe–not threatening President Trump.